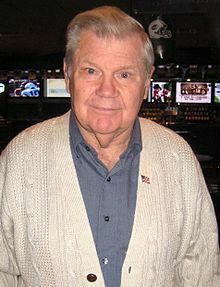 Bob Hastings in October 2008. Robert "Bob" Hastings (April 18, 1925 – June 30, 2014) was an American movie, television, voice, stage, and radio actor who is known for his voice work as Commissioner James Gordon in Batman: The Animated Series. Hastings was born on April 18, 1925 in Brooklyn, New York City. Hastings had been married to Joan Rice since the 1940s. They had four children. His brother was actor Don Hastings. Hastings died from prostate cancer on June 30, 2014 in Burbank, California, aged 89. ↑ Newcomb, Roger (July 1, 2014). "Former 'General Hospital' Actor Bob Hastings Has Died at age 89, Brother of 'As the World Turns' Star Don Hastings". We Love Soaps. Retrieved July 2, 2014. Wikimedia Commons has media related to Bob Hastings. This page was last changed on 8 November 2017, at 00:11.